Turmeric is often considered a natural remedy for the most common ailments. It is also recommended as an alternative to pharmaceuticals. But although it is a natural substance, it is not without side effects. 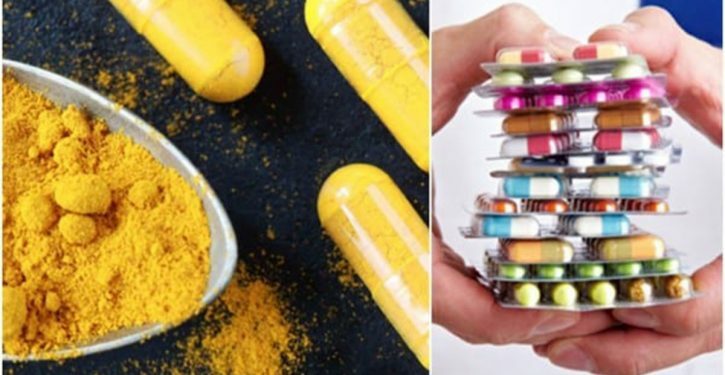 Indeed, research has shown that turmeric can actually cause serious side effects if taken in high doses or in combination with certain drugs. The use of turmeric, which has become very popular in recent years, dates back thousands of years, when it was used in South Asia as a culinary spice, spiritual custom, ancestral beauty secret and Ayurvedic medicine treatment. Most of its incredible benefits come from its concentration of curcumin, a substance responsible for its yellowish color. Extensive studies on curcumin have shown anti-inflammatory, anti-oxidant, anti-cancer and anti-thrombotic effects (reduced blood clots). Because of all these beneficial properties, many people often use turmeric as an alternative to their treatments or to lessen the side effects of the medications they take. However, in some cases, its most advantageous properties can be dangerous or even fatal because of its active ingredients and because it can stimulate the effects of drugs and cause a number of unpleasant reactions. This does not mean that turmeric is not good, but that some drugs may interact negatively with this natural plant. Turmeric is a natural anticoagulant due to its antithrombotic power. It is actually capable of reducing blood clots, making it dangerous to take it in combination with anticoagulant therapy to treat cardiovascular disease. Consumption of this plant may enhance their effects and increase the risk of internal bleeding. Anticoagulant medications include warfarin, clopidogrel, and aspirin. Turmeric naturally relieves irritable bowel syndrome, a digestive disorder characterized by pain and stomach discomfort. But when taken in combination with gastroesophageal reflux drugs such as cimetidine, famotidine, ranitidine, and omeprazole, it may cause some reactions. Taken in combination with these medications, it will actually stimulate the production of gastric fluids by your body. This can cause nausea, bloating, stomach pain, as well as esophageal lesions. Exerting remarkable antidiabetic effects, turmeric naturally reduces blood sugar levels. When taken in combination with diabetes treatments, it can cause a further drop in blood sugar levels, leading to hypoglycaemia. This can lead to a number of side effects, including tremors, anxiety, blurred vision, delirium, and reduced cognitive function. People taking antihistamines may be faced with a problem related to turmeric consumption. This can cause allergic reactions, such as hives or rashes, or even shortness of breath and anaphylaxis. If you are taking any medicine or if you have any allergic symptoms when taking turmeric, it is advisable to stop taking it and find other alternatives. If you follow any of the above treatments, it is recommended to ban the consumption of turmeric. Your doctor may suggest other natural alternatives or prescribe specific dosages that will not have any adverse health effects in combination with your treatment.